7 Dec 2015 | What's new? 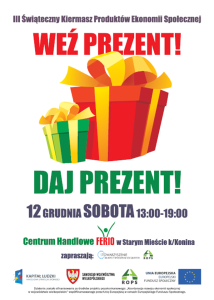 Stowarzyszenie Na Rzecz Spółdzielni Socjalnych (Association For Social Cooperatives) & KOPS, invite you to the III Christmas market with Social Economy products! The market, taking place in the shopping center ferio, located in the old town of Konin. Saturday 12, from 19h till 20h, surround yourself with enchanted atmosphere, christmas spirit, beautiful decorations, local food and great people! It means also an opportunity to know the Social Cooperatives that work in Konin and that will be present in the market with their products! Organized by: Kapital Ludzki: Narodowa Strategia Spojnosci (Human Capital: National Cohesion Strategy), Samorzad Województwa Wielkopolskiego (Government of Wielkopolska), KOPS and Unia Europejska: Europejski Fundusz Spoleczny (European Union: European Social Fund).